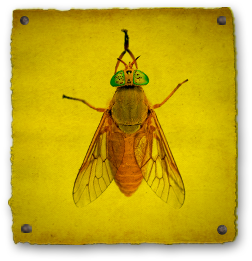 Deer flies are larger than houseflies. They are very annoying pests, and can cause very painful and irritating bites. Deer flies tend to attack humans more than horse flies. The females lay eggs on vegetation near water, and the larvae develop in moist soil near streams, marshes, and ponds. Emerging adults are fast, strong fliers. Keeping doors and window screens in good repair can help keep deer flies out of the house. In addition to using insect repellents, wearing long sleeve shirts, long pants, and netting for face protection can reduce bites from deer flies when outdoors.